California unequivocally makes great Pinot Noir. But who makes it better? Santa Barbara’s Santa Maria Valley AVA, or their northern brothers in Monterey’s Santa Lucia Highlands AVA? Well, it’s really a tale of two regions, vastly different yet surprisingly similar, but each with their own characteristics. The often foggy and windswept Santa Maria Valley is the northern most appellation in Santa Barbara County. Established as an AVA in 1981 it is full of complex soil conditions and diverse microclimates. Chardonnay and Pinot Noir are two varieties, which especially benefit from the Pacific Ocean’s influence. You’ll find older wineries like Lucas & Lewellen, Byron and of course the most famous vineyard in these parts, Bien Nacido. Grapevines went into the ground here around 1830 but it was the early 1970s when commercial plantings began to flourish. 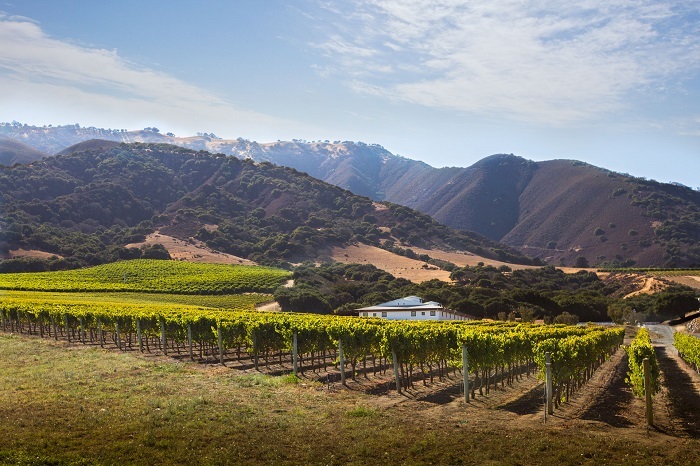 The Santa Lucia Highlands AVA (established in 1991) perches on the east-facing terraces of the Santa Lucia mountain range to the south of Monterey Bay. Spanish missionaries first planted wine grapes here in the 1790s, but the following 200 years was more consumed with vegetable farming than viticulture. But thanks to a small pioneering group of farming families including Hahn Estate, Paraiso, and La Estancia, the region's winegrowing potential came of age in the mid-1970s. The SLH includes approximately 6,400 planted acres of predominantly Pinot Noir and Chardonnay. Of course soil is the other important factor. Soils in the Highlands are granite-based alluvial deposits created thousands of years ago from geology in the mountain range to the west. In the Santa Maria Valley most of the soils are sedimentary. Matt Kettmann, California Central Coast Editor for Wine Enthusiast Magazine knows the region better than most anyone. “The Santa Maria Valley and Santa Lucia Highlands together represent the wide range of Pinot Noir styles available on the Central Coast. While both are hammered by the coastal elements of wind, fog, and cool weather, I find that, generally speaking, Santa Maria Pinots are lighter in body and brighter in red fruit while the Santa Lucia Highlands tend to produce much richer, darker, powerful wines. There are of course exceptions to such broad-based generalizations, but I often find the Santa Lucia Highlands to be much more like the Sta. Rita Hills (in Santa Barbara County), while the Santa Maria Valley reminds me more of San Luis Obispo’s Edna Valley.” Swan agrees. “Wine styles will vary from one vineyard to the next and according to producer preference. However, in general, I find the wines in Santa Maria to be slightly lighter in body, lower in alcohol and higher in acidity. I also find the red wines to be more savory.” Swan notes that Santa Maria Pinot Noirs can show more notes of earth, tea, and non-oak derived spice, whereas those from Santa Lucia Highlands are substantially fruit-driven. “What's great is that such a diverse palate exists and can please quite a few different taste profiles all just 150 miles apart right off Highway 101,” says Kettmann. Here then are four Pinots to examine: Cambria and Presqu’ile from Santa Maria, and Lucienne and McIntyre from Santa Lucia Highlands. You may debate the merits of each, but they all showcase what’s best about their AVAs. There is an earthiness and richness to this wine, showing a strong mid palate acidity. There is the red raspberry, strawberry, plum and with back notes of wild flowers and fresh herbs, licorice and blackberries. From the start there is brambly red raspberry, black cherry and boysenberry with back notes of violets, wild grasses, licorice and a slight cola note. The acidity fills the mid palate and this expresses earthy fruits while maintaining a true Pinot Noir character. Reflecting brighter fruit and more focused acidity, this wine presents red raspberry, plum, black cherry, blackberry, herbal notes and a lengthy finish. It’s a lively wine, farmed according to the SIP Certified practices (Sustainability in Practice) uses three clones, Swan, 115 and Old Vine (a four-decade old planting). Aged 16 months in 40% new French Oak, the barrels in no way inhibit the cherry, raspberry, black berry and plum. There is an earthy quality but the brightness of the fruit, in part due to a slightly warmer climate at this vineyard, makes this a little more effusive, providing a richness without being overwrought. Link diretly to the article here.